Mantua – new chances in bioenergy? DanubEnergy partner AGIRE suggests development plan for the industrial district of Mantua centred on the production of bioenergy. Historic centre of Mantua surrounded by three lakes. Petrochemical district - commonly called "poisson hills" by the people of Mantua. The old town of Mantua, foundered by the ancient Etruscans and well known as one of the main Italian cultural centres of the Renaissance period, is presently faced with grave environmental and economic troubles. 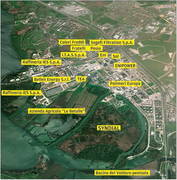 In the sixties, one of largest petrochemical districts of the Lombardy region was established in the close vicinity of Mantua in order to boost the economy of the region. However, in the meantime the damages to the environment have became obvious and also the initial benefits fade away due to the recent economic crisis. The decontamination and recultivation of the industrial area is presently a matter of vigorous debate among the political authorities - central Italian government, region of Lombardy, and city administration of Mantua -, former or current owners of the plants, and, of course, concerned citizens of the region. AGIRE proposes to redevelop the former petrochemical district with focus on the production of bioenergy. Model for the proposal is the biorefinery of Crescentino (Piedmont Region) which went into operation in January 2013 having a production capacity of 75 million litre of bioethanol per year. The biorefinery uses biomass, mainly rice straw, available in an area with 70 km radius around the plant. AGIRE points out that the region of Mantua would be an ideal location for such kind of biorefinery due to its excellent infrastructure and the large amounts of available biomass, mainly gentle reed from close-by riparian areas.